Vetrofen Healthy is a new supplement by animalife designed to give everyday support to comfort and mobility in active or ageing horses. Vetrofen Healthy is a proprietary blend of three plant sources known for their effective plant antioxidant support, Acacia catechu, Boswellia and Curcumin, with black pepper to aid absorption. Boswellia serrata (also known as Frankincense) has been used for centuries to support joint health; Acacia catechu has long being recognised in ayurvedic practitioners for its antioxidant properties and curcumin, from fenugreek is similarly revered in India as an antioxidant. Vetrofen Healthy approaches ongoing support of comfort and mobility by uniquely addressing the supply of dietary antioxidants to the metabolic processes involved. Vetrofen Healthy harnesses the power of specific plant phytochemicals - polyphenols, flavanols and triterpenes - from natural sources. Each work synergistically to provide support to key areas where antioxidant support is required on a daily basis – in the joints and muscles, and to the immune system. 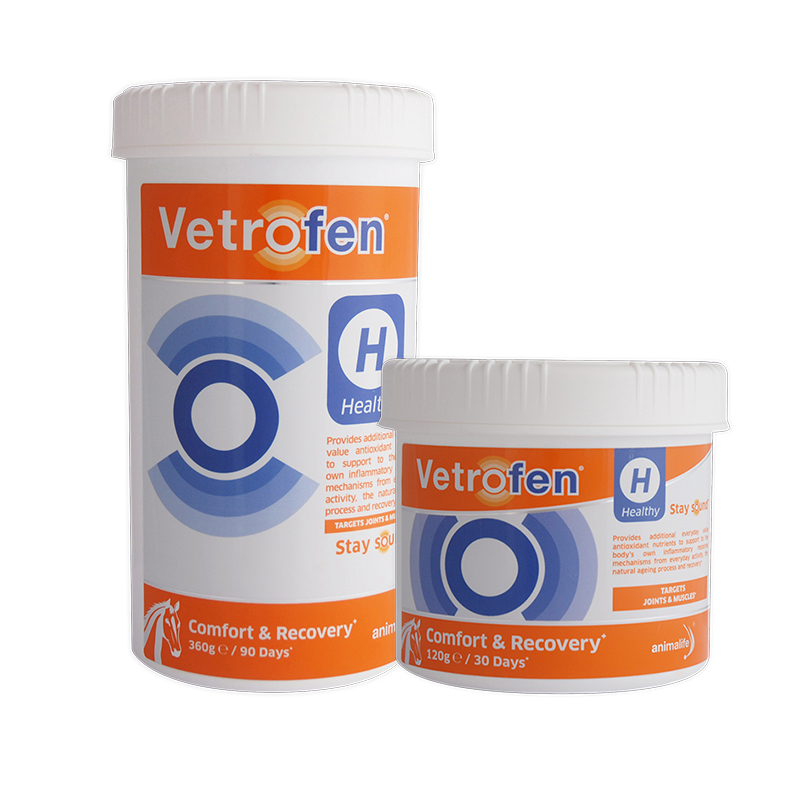 Vetrofen Healthy provides additional antioxidant nutrients to support the body’s own inflammatory response mechanisms. The specific antioxidants work synergistically at cell level to support comfort, function and flexibility in joints, muscles, ligaments and tendons. The concentrated and varied antioxidant profile of Vetrofen Healthy works to promote overall wellbeing and quality of life for your horse. Great for keeping the active or ageing horse comfortable and happy. Represents a unique and proven approach to managing comfort and recovery.